Want a party unlike any other birthday party your child has been to? With a Ninja party at CORE, your child will walk in as a regular kid and walk out a NINJA! Your child and their guests will take part in NinjaZone training, utilizing CORE's special Ninja equipment to learn basic Ninja skills, play games, and have a BLAST with their friends. Our Ninja Parties are unique and fun, and something your birthday child and guests won't forget! Private use of the entire CORE Kids Academy facility for 90 minutes—60 minutes of Ninja training led by two energetic coaches and a half hour in our party room. 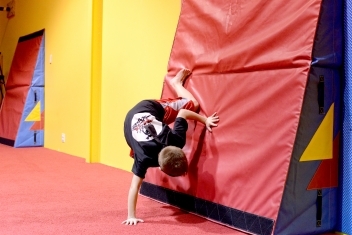 A fast-paced and fun obstacle warm up, using all our special Ninja mats! Age-appropriate circuits that incorporate all of our equipment, including the 30-foot inflatable obstacle course, 4 in-ground trampolines, tumbletrak, and MUCH more! The sky-high ride of a lifetime in our FLY HARNESS! Red and black paper products including plates, napkins, and utensils that keep with our Ninja theme-- post-party cleanup is covered, too. One red or black balloon for each child and three special Ninja balloons and a Ninja headband for the birthday child! A Ninja party can be booked during any of our avaliable party time slots for an additional $50.